TL1A is a novel TNF-like factor that acts as a costimulator of IFN-γ secretion through binding to the death domain-containing receptor, DR3. The aim of this study was to test the hypothesis that TL1A may play an important role in inflammatory bowel disease (IBD) by functioning as a Th1-polarizing cytokine. The expression, cellular localization, and functional activity of TL1A and DR3 were studied in intestinal tissue specimens as well as isolated lamina propria mononuclear cells from IBD patients and controls. TL1A mRNA and protein expression was up-regulated in IBD, particularly in involved areas of Crohn’s disease (CD; p < 0.03 vs control). TL1A production was localized to the intestinal lamina propria in macrophages and CD4+ and CD8+ lymphocytes from CD patients as well as in plasma cells from ulcerative colitis patients. The amount of TL1A protein and the number of TL1A-positive cells correlated with the severity of inflammation, most significantly in CD. Increased numbers of immunoreactive DR3-positive T lymphocytes were detected in the intestinal lamina propria from IBD patients. Addition of recombinant human TL1A to cultures of PHA-stimulated lamina propria mononuclear from CD patients significantly augmented IFN-γ production by 4-fold, whereas a minimal effect was observed in control patients. Our study provides evidence for the first time that the novel cytokine TL1A may play an important role in a Th1-mediated disease such as CD. The TNF superfamily of proteins (SFPs) 3 consists of 18 type 2 proteins that exist in either membrane-bound or soluble forms (1). Receptors for these ligands are type 1 transmembrane proteins characterized by the presence of cysteine-rich domains and likewise comprise the TNF receptor (TNFR) SFPs (2). Binding of TNF-like ligands to their cognate receptor(s) triggers intracellular pathways that are directly involved in cell proliferation, differentiation, and survival (3). Most members of the TNF/TNFR SFPs are expressed on cells of the immune system and play a critical role in multiple components of the immunologic response, including defense against microorganisms, inflammation, programmed cell death, as well as the overall development of the immune system (1, 2, 3). Accordingly, genetic defects in TNF/TNFR interactions lead to well-defined autoimmune disease states (4, 5, 6, 7, 8), whereas pharmacologic blockade of this ligand-receptor binding has been successfully used for the treatment of several inflammatory conditions (9, 10). Ulcerative colitis (UC) and Crohn’s disease (CD), collectively referred to as inflammatory bowel diseases (IBD), are chronic conditions characterized by remitting and relapsing inflammation of the small and/or large intestines (11). Although both diseases are considered to arise from a dysregulated immune response of the gut-associated immune system (12), CD and UC display diverse immunological phenotypes. UC is characterized by increased mucosal secretion of IL-5, but not of IL-4, IFN-γ, or TNF (13). In contrast, CD represents a prototypical Th1-mediated condition, since mucosal immune cells from affected individuals secrete IFN-γ and TNF as well as IL-12 and IL-18, but not Th2-type cytokines (13, 14, 15). Accordingly, the use of neutralizing mAbs against TNF has proven to be very effective in ameliorating the severity of intestinal inflammation in CD (16). Collectively, these data point to the central role that interactions between TNF and its receptors play in the pathogenesis of CD. Recent studies in animal models of colitis have shown that other members of the TNF/TNFR SFPs may be involved in the development of intestinal inflammation. Specifically, blockade of lymphotoxin/lymphotoxin β receptor (17), CD40/CD154 (18), or OX-40/OX-40L (19) interactions resulted in significant disease improvement in the CD4/CD45RBhigh transfer model of colitis, supporting the concept that the TNF SFPs play a central role in Th1-mediated intestinal inflammatory disease. TL1A is a recently described member of the TNF SFPs that was shown to be expressed primarily in endothelial cells (20). TL1A represents a ligand for the death domain-containing receptor DR3 (20). DR3 is expressed mainly on lymphocytes, and its interaction with TL1A can provide a costimulatory signal for the activation of T cells. TL1A can also bind to the decoy receptor TR6/DcR3, which competes with DR3 for TL1A binding. Interestingly, TL1A was shown to enhance the secretion of IFN-γ and GMCSF from T cells without affecting the production of IL-2, IL-4, IL-10, or TNF (20). This specific induction of IFN-γ prompted us to test the hypothesis that TL1A may possess unique Th1-polarizing properties and may play an important role in diseases mediated by Th1-type immune responses. In the present study we describe, for the first time, increased expression of TL1A in CD, a typical Th1-mediated disease as well as in UC. The cellular localization of TL1A and its cognate receptor, DR3, are also reported as well as the specific stimulatory effects of TL1A on IFN-γ production from lamina propria lymphocytes derived from CD patients. Finally, we describe the novel observation that TL1A expression is not limited to endothelial cells, but is also produced by other cell types of the gut mucosa, including lamina propria lymphocytes as well as tissue macrophages. mAbs against human TL1A (clone 12F11, IgG1) and human DR3 (clone 11H08, IgG1) were generated as described previously (20). Biotinylated goat anti-mouse IgG1 (BD Biosciences, Mountain View, CA) was used as the secondary Ab for immunohistochemical studies. Mouse anti-human CD3 (R&D Systems, Minneapolis, MN) and mouse anti-human CD138 (Serotec, Raleigh, NC) were also used. For flow cytometric studies, purified mouse IgG1 (MOPC-31C), FITC-conjugated goat anti-mouse IgG, allophycocyanin-conjugated mouse anti-human anti-CD45 (clone HI30), as well as PE-conjugated mouse anti-human Abs against CD4 (RPA-T4) and CD8 (HIT8a) were all purchased from BD Biosciences. A total of 33 IBD and 17 non-IBD (control) patients were included in the present study. Surgical specimens were obtained from patients with IBD who underwent therapeutic bowel resection at University of Virginia Digestive Health Center of Excellence as well as from control patients who underwent bowel resection for noninflammatory, malignant and nonmalignant conditions. All surgical specimens were collected immediately following resection, opened longitudinally, rinsed, and examined for gross morphological changes, and representative full-thickness samples were obtained. When possible, samples were derived from areas of active disease (involved) as well as macroscopically normal (noninvolved) areas from the same patient. In addition, endoscopic biopsies were obtained from CD, UC, and control patients undergoing flexible sigmoidoscopy or colonoscopy for diagnostic or surveillance purposes and were used for mRNA studies. All diagnoses were confirmed by accepted clinical, radiological, endoscopic, and histologic criteria. Informed consent was obtained from each patient. All protocols were approved by the internal review board of University of Virginia Health System. LPMC were isolated and purified from freshly resected surgical specimens as previously reported (15). Briefly, dissected intestinal mucosa was freed of mucus and epithelial cells in sequential steps using DTT (Sigma-Aldrich, St. Louis, MO) and EDTA and was subsequently digested with collagenase type 3 (Worthington Biochemical Corp., Lakewood, NJ) and DNase type I (Sigma-Aldrich). The resulting crude cell suspension was preferentially enriched for intestinal LPMCs using a Ficoll-Paque Plus gradient (Amersham Pharmacia Biotech, Uppsala, Sweden) following the manufacturer’s protocol. Following isolation, LPMC were resuspended in culture medium (RPMI 1640 with 10% FBS, 0.015 M HEPES buffer, and 2.5% antibiotic-antimycotic solution) at a concentration of 106 cells/ml and seeded into 96-well plates (200 μl/well). Cells were cultured unstimulated or under suboptimal stimulation with 1 μg/ml PHA. In some of the wells, recombinant human TL1A protein was added at a concentration of 10 or 100 ng/ml. Culture supernatants were collected after 72 h, and the IFN-γ protein concentration was measured with a commercially available ELISA (R&D Systems, Minneapolis, MN). Tissue samples were fixed by immersion in Bouin’s fixative (LabChem, Pittsburgh, PA) for 12–24 h at 24°C, placed in labeled tissue cassettes, agitated for 24 h, and processed overnight in a Citadel 2000 tissue processor (Thermo Shandon, Pittsburgh, PA). Samples were sequentially dehydrated with 70% ethanol (7 h), 95% ethanol (twice, 60 min each time), and 100% ethanol (2 × 60 min), cleared in xylene (2 × 60 min), infiltrated with supporting paraffin (twice, 60 min each time), and embedded in TBS Polyfin wax (Triangle Biomedical Sciences, Durham, NC). Three-micron-thick sections were obtained from the blocks, mounted on SuperFrost Plus glass slides (Fisher Scientific, Pittsburgh, PA), deparaffinized in xylene (twice, 10 min each time), and rehydrated in absolute ethanol (twice, 5 min each time). Samples were blocked for endogenous peroxidase activity using 1% H2O2 in methanol for 30 min, rinsed in PBS (twice, 5 min each time), blocked again for 20 min with 3% BSA/PBS (Sigma-Aldrich), and rinsed in PBS. Sections were immunostained overnight at 4°C using affinity-purified mouse anti-human TL1A (12F11) or mouse anti-human DR3 (11H08) mAbs (1 mg/ml; dilution, 1/2000) as the primary detecting Abs. Slides were then rinsed with PBS and incubated in the dark for 30 min with a biotinylated goat anti-mouse IgG1 Ab, rinsed in PBS, and incubated with an avidin/biotin complex (Vectastain Elite ABC Kit; Vector Laboratories, Burlingame, CA). Immunoreactive cells were visualized by addition of a diaminobenzidine substrate and were counterstained with hematoxylin. All incubations were conducted at room temperature unless otherwise noted. Negative controls were prepared under identical immunohistochemical conditions as described above, replacing the primary TL1A/DR3-detecting Abs with 3% BSA/PBS serum. In some experiments we performed double immunostaining of 2-μm paraffin-embedded sections. Briefly, sections were stained with affinity-purified mouse anti-human TL1A mAb (12F11), and the next serial sections were stained with mouse anti-human Abs against CD3 or CD138. Total protein levels of tissue homogenates (full thickness samples from surgical specimens) were quantified using a modification of the Bradford colorimetric procedure (Protein Assay; Bio-Rad Laboratories, Hercules, CA). Tissue homogenates (standardized to 250 μg of total protein/lane) were then resolved by 12% Tris-glycine denaturing SDS-PAGE and transferred for 60 min at 100 V in transfer buffer (20% methanol, 192 mM glycine, and 25 mM Tris, pH 8.0; all from Sigma-Aldrich) onto a polyvinylidene difluoride membrane (Bio-Rad) using an electrophoretic transfer unit (Mini Trans-Blot Electrophoretic transfer cell; Bio-Rad). Pellets from stable cell lines expressing pcDNA3.1 vector control or full-length TL1A (20) were used as negative or positive controls, respectively. Recombinant TL1A (amino acids 72–251) (20) was also used as a positive control. Following transfer, membranes were incubated overnight in PBS at 4°C, blocked for 1 h at room temperature in 20 ml of 5% nonfat dry milk in PBS, washed in PBS containing 0.1% Tween (Sigma-Aldrich; three times, 10 min each time), and incubated with an affinity-purified mouse anti-human anti-TL1A Ab (12F11; 1.0 μg/ml) for 2 h at room temperature on an orbital shaker. Blots were subsequently washed in PBS/0.1% Tween (three times, 10 min each time) and incubated with an anti-mouse IgG1 HRP-conjugated Ab (1/100; BD PharMingen, San Diego, CA) for 1.5 h at room temperature, also on an orbital shaker. Finally, blots were sequentially washed in PBS/0.1% Tween (twice, 10 min each time), and plain PBS (10 min), incubated with ECL detection reagent (Amersham Life Science, Arlington Heights, IL) at 5 ml/membrane for 1 min at room temperature, and exposed to X-OMAT autoradiography LS film (Eastman Kodak, Rochester, NY) with intensifying screens for 5–15 s.
For measurements of TL1A mRNA transcripts, intestinal tissue obtained from surgical specimens or endoscopic biopsies was homogenized, and total RNA was isolated using an RNeasy Mini Kit (Qiagen, Valencia, CA), following the manufacturer’s protocol. DNA contamination was avoided by DNase digestion of the samples. First-strand cDNA synthesis was conducted using the GeneAmp RNA-PCR kit (PerkinElmer, Boston, MA). A total of 500 ng of RNA was used as a template. Real-time monitoring of PCR reactions was performed using the iCycler iQ Real-Time PCR Detection System (Bio-Rad) and the iQ SYBR-Green Supermix. Each reaction was conducted in 25-μl volumes containing cDNA (1 μl of the first-strand cDNA synthesis reaction) and 400 nM of each gene-specific primer. TL1A-specific primers were used in our study (forward primer, 5′-GCAGGACTCACCACATACC-3′; reverse primer, 5′-CCTTGGCTTATCTCCGTCTG-3′) to amplify a 147-bp amplicon of the TL1A cDNA. TL1A mRNA was normalized to the 18S ribosomal RNA internal control in each sample. LPMC, isolated from surgical specimens, were suspended in staining buffer (PBS with 1% FBS) at a concentration of 106 cells/ml. Cells were incubated with 0.5 μg/106 cells of mouse anti-human mAb against TL1A (12F11) or mouse anti-human mAb against DR3 (11H08). Mouse IgG1 served as the isotype control. 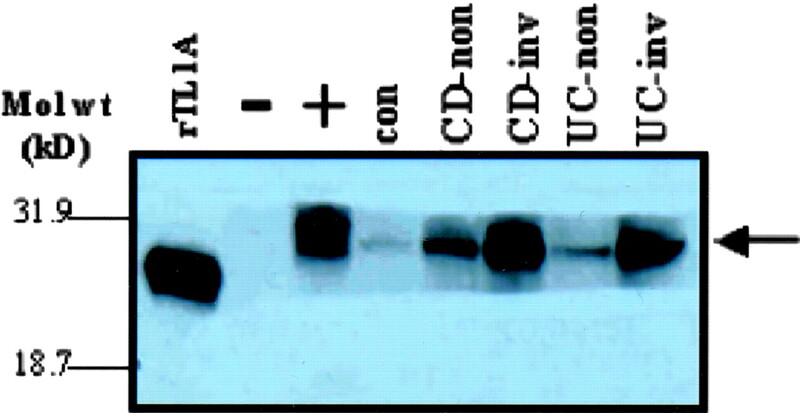 Cells were washed twice and then incubated with FITC-conjugated goat anti-mouse Ab (secondary). Finally allophycocyanin-conjugated mouse anti-human anti-CD45 and PE-conjugated mouse anti-human anti-CD4 or anti-CD8 Abs were added. Three-color flow cytometric analysis was performed on a FACSCalibur (BD Biosciences). Lymphocytes were gated by size on forward and side scatter and by CD45 expression. The percentage of cells expressing various surface molecules and the intensity of fluorescence were analyzed with the use of CellQuest software (BD Biosciences). Relative TL1A mRNA ratios for non-IBD, UC-noninvolved, UC-involved, CD-noninvolved, and CD-involved specimens were compared using a two-sided Student’s t test. An α level of 0.05 was considered significant (p < 0.05). The expression of TL1A at the protein level was studied in freshly resected surgical specimens from CD and UC patients as well as non-IBD controls. Western blot analysis showed minimal quantities of TL1A protein in control specimens (Fig. 1⇓). In contrast, not only was TL1A present in IBD patients, but its expression correlated with the severity of inflammation as well. Indeed, TL1A expression was greatly up-regulated in involved areas of CD or UC compared with noninvolved regions in the same patient (Fig. 1⇓). To confirm the results obtained from Western blot, we performed immunohistochemical studies using an affinity-purified mAb against TL1A. Staining for TL1A was absent or minimal in tissues from control patients (Fig. 2⇓, A and B). On the contrary, intense staining for TL1A was identified in specimens from IBD patients, especially in CD patients (Fig. 2⇓, C–F). Staining for TL1A was consistently localized to the intestinal lamina propria. The number of TL1A-positive cells was greatly increased in specimens from involved vs noninvolved areas in both UC (Fig. 2⇓, C and D) as well as CD (Fig. 2⇓, E and F) patients. Increased expression of hTL1A in tissue specimens obtained from IBD patients compared with control samples. Two hundred and fifty micrograms of total protein of tissue homogenates was resolved by SDS-PAGE and transferred onto a polyvinylidene difluoride membrane. Following blocking and washing, membranes were sequentially incubated with mouse anti-human TL1A mAb (primary; 1 μg/ml) and anti-mouse IgG1 HRP conjugated Ab (secondary; 1/100). Human TL1A was detected by enhanced chemiluminescence. A representative blot of three separate experiments is shown and demonstrates that TL1A protein was hardly detected in control specimens, but was greatly increased in specimens from CD and UC patients. Abundant expression of TL1A was seen in involved areas, especially from CD patients. rTL1A, recombinant human TL1A (aa 72–251); −, negative control, stable cell line expressing pcDNA3.1 vector; +, positive control, stable cell line expressing full-length TL1A; con, non-IBD control; CD-non, CD noninvolved; CD-inv, CD involved; UC-non, UC noninvolved; UC-inv, UC involved. Immunohistochemical staining for hTL1A in paraffin-embedded sections from control and IBD patients. An affinity-purified mouse anti-human TL1A mAb was used to detect immunoreactivity against TL1A. A, Negative control, in which the primary TL1A detecting Ab was replaced by 3% BSA/PBS serum, showed complete lack of immunoreactivity. B, Non-IBD controls showed no evidence of staining for TL1A. C and D, In surgical specimens from UC patients, weak to moderate staining for TL1A was observed with increasing frequency from noninvolved (C) to involved areas (D). E and F, surgical specimens obtained from CD patients showed moderate to intense staining for TL1A. TL1A-immunoreactive cells were localized in the intestinal lamina propria and were greatly increased in areas of active disease (F) compared with noninvolved regions (E). 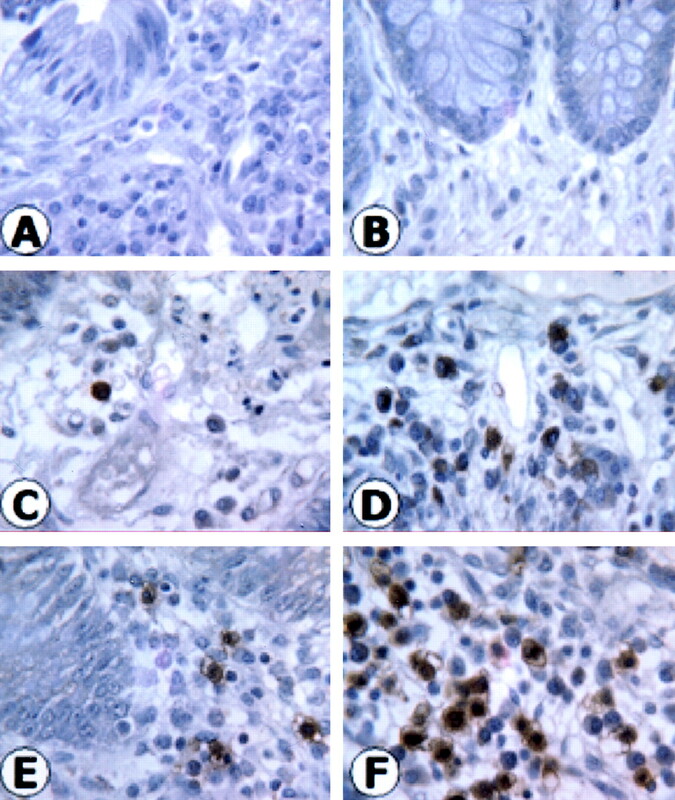 Five separate experiments showed similar patterns of immunohistochemical staining for TL1A. Original magnification of A-F, ×100. We next investigated whether a similar increase in TL1A expression in IBD patients could be detected at the mRNA level. The relative expression of TL1A mRNA transcripts is shown in Fig. 3⇓. In our study UC was not associated with an increase in TL1A mRNA expression compared with the control group. In contrast, we observed a progressive increase in the expression of TL1A mRNA transcripts in CD patients, which was present in noninvolved areas (2-fold increase vs controls, p = 0.054) and was further augmented in specimens from inflamed areas (3.4-fold increase vs controls, p = 0.028; Fig. 3⇓). Overall, these studies showed that the novel TNF-like ligand, TL1A, is present in the lamina propria of patients with IBD, correlates with disease severity, and shows a significant association with CD. 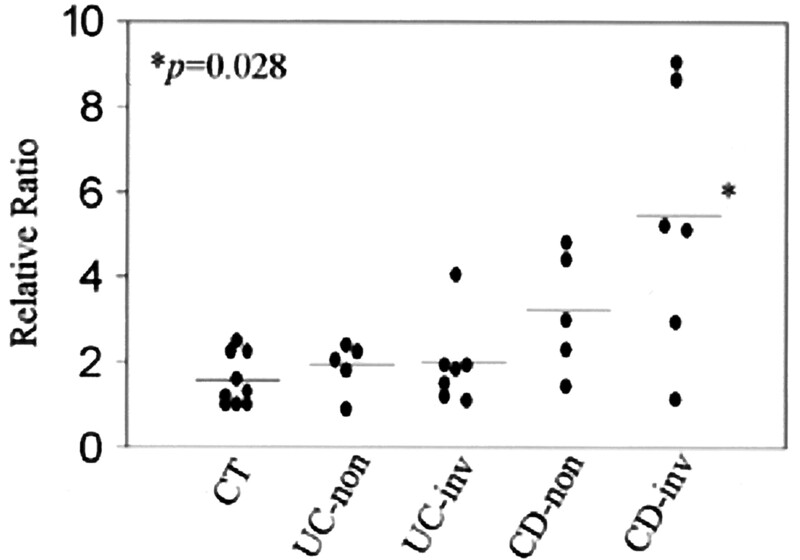 Increased expression of hTL1A mRNA transcripts in tissue specimens obtained from CD patients (involved and noninvolved areas) compared with specimens from UC or control patients. Total RNA was extracted from tissue homogenates. First-strand cDNA was generated and used as a template in real-time PCR reaction with hTL1A gene-specific primers. In parallel reactions, 18S ribosomal RNA was measured. Human TL1A mRNA was normalized against the 18S ribosomal RNA internal control. To avoid any biases related to differences in RNA extraction and cDNA generation, readings were further normalized to the lowest control sample, which was always considered 1. CT, non-IBD controls; UC-non, noninvolved UC; UC-inv, involved UC; CD-non, noninvolved CD; CD-inv, involved CD. ∗, p = 0.028 vs non-IBD. Recent studies have reported that TL1A is expressed on endothelial cell lines exclusively (20). We hypothesized that in the clinical setting of active intestinal inflammation, cells of the immune system might express this TNF-like molecule as well. Our immunohistochemical data showed that in CD, two types of cells stained positively for TL1A. First, as shown in Fig. 4⇓A, cells with the morphology of tissue macrophages expressed TL1A in large numbers. In addition, in the lamina propria of CD patients, lymphocytes were positive for TL1A (Fig. 4⇓B). To further validate these observations, we first performed flow cytometric analysis of LPMC isolated from surgical specimens. Our flow cytometric data support the immunohistochemistry results, since we detected the expression of TL1A in subsets of both CD4+ and CD8+ lymphocytes and confirmed the increased expression in involved areas of CD (Fig. 4⇓D). 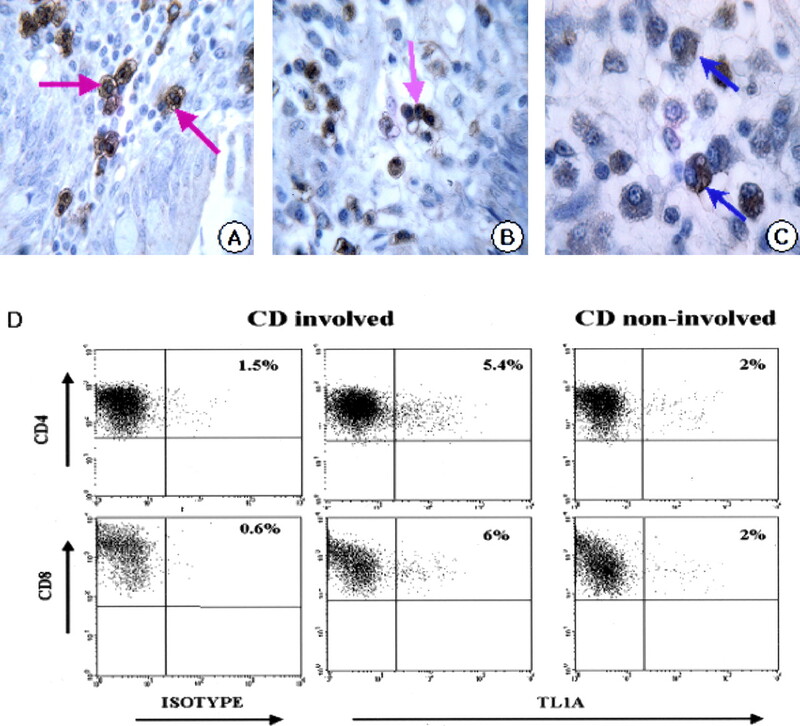 Similar results were obtained by double immunostaining of serial sections from CD specimens, since large number of cells that showed immunoreactivity against anti-human TL1A Ab also stained positively for CD3 expression (Fig. 5⇓, upper panel). In UC, the cellular localization of TL1A was different from that in CD. Indeed, when staining was observed in UC specimens, it primarily involved lamina propria cells with morphology consistent with that of plasma cells (Fig. 4⇓C). In addition, cells staining positively for human TL1A (hTL1A), displayed surface expression of CD138, a marker characteristic of plasma cells (Fig. 5⇓, lower panel). TL1A staining of endothelial cells was rarely seen in either CD or UC tissue specimens (data not shown). In summary, these data show that TL1A is expressed on nonendothelial cells within the intestinal lamina propria and that diversity exists between CD and UC with regard to the cellular localization of TL1A. Cellular localization of TL1A expression in involved areas of IBD patients. A, Immunohistochemical staining for hTL1A in paraffin-embedded sections from an involved area of a CD patient revealed increased immunoreactivity on cells with the characteristics of tissue macrophages (red arrows). B, Lymphocytes (pink arrow) from an involved area of a CD patient showed intense reactivity against an affinity-purified mouse anti-human TL1A mAb. C, Immunohistochemical staining for hTL1A in paraffin-embedded sections from an involved area of a UC patient revealed increased immunoreactivity on cells with the characteristics of plasma cells (blue arrows). Original magnification of A–C, ×100. D, Flow cytometric detection of TL1A expression on lymphocytes from CD patients. Enriched LPMCs populations were obtained from involved IBD areas. Cells were sequentially stained with mouse anti-human TL1A mAb (primary), goat anti-mouse FITC-conjugated IgG (secondary), mouse anti-human APC-conjugated CD45, and mouse anti-human PE-conjugated CD4 or CD8 Abs. Lymphocytes were gated by size and CD45 expression, and the percentage of TL1A-positive cells was analyzed in CD4+ or CD8+ populations by flow cytometry. Data shown are representative of five experiments. Differential cellular expression of TL1A in UC and CD. Sequential 2-μm paraffin-embedded sections were stained with affinity-purified mouse anti-human TL1A mAb (12F11) or with mouse anti-human Abs against CD3 or CD138. 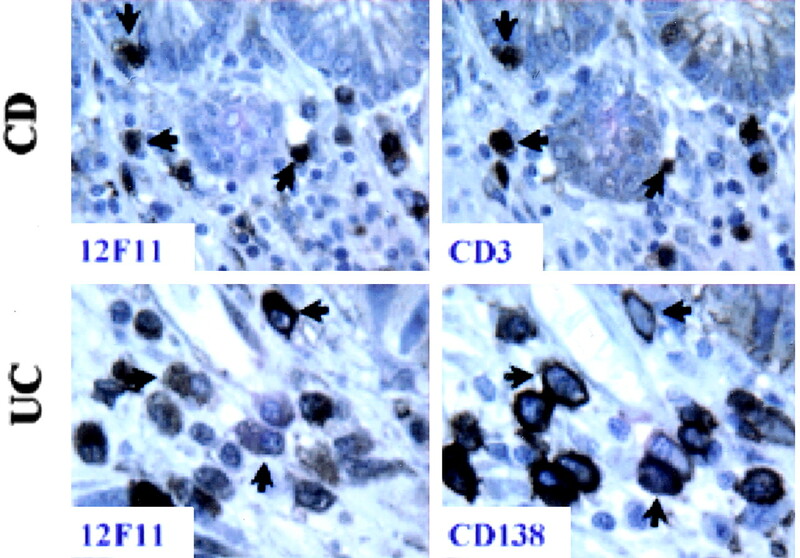 Upper panel, A large number of cells immunoreactive against both 12F11 and CD3 were detected in intestinal specimens from CD patients, indicating increased expression of TL1A on T lymphocytes in involved areas of CD. Lower panel, In UC patients, large numbers of cells immunoreactive against both 12F11 and CD138 were detected, indicating increased expression of TL1A on plasma cells in involved areas of UC. Arrows indicate identical cells in the two upper or the two lower photomicrographs, respectively. Magnification of all photomicrographs, ×100. DR3 is primarily expressed on activated lymphocytes (20). Since IBD is characterized by infiltration of the bowel wall with lymphocytes that display an activated phenotype, we hypothesized that DR3 expression may be detected in involved intestinal areas of IBD patients. Our immunohistochemical studies showed rare DR3 expression in control intestinal tissue that was modestly increased in noninvolved areas from UC or CD patients (data not shown). In contrast, the expression of DR3 was highly up-regulated in involved areas from both UC and CD patients (Fig. 6⇓A). As in the case of TL1A, staining for DR3 was confined in the lamina propria. Further morphological analysis of DR3-positive cells showed that this population primarily consisted of lymphocytes, regardless of disease phenotype (CD or UC; Fig. 6⇓A, insets). These results were also confirmed by flow cytometry that showed cell surface expression of DR3 on CD4+ and CD8+ cells of the intestinal lamina propria (Fig. 6⇓B). Collectively, these data demonstrate that lymphocytes from inflamed areas of CD and UC up-regulate the expression of DR3 in accordance with the activated state of these cells in the intestinal lamina propria of IBD patients. Increased DR3 expression on lymphocytes from involved areas of IBD patients. A, Immunohistochemical staining for hDR3 in paraffin-embedded sections from CD and UC patients was performed using an affinity-purified mouse anti-human DR3 mAb. Increased numbers of immunoreactive cells were detected in the lamina propria of intestinal specimens from both a CD (left) as well as a UC (right) patient. 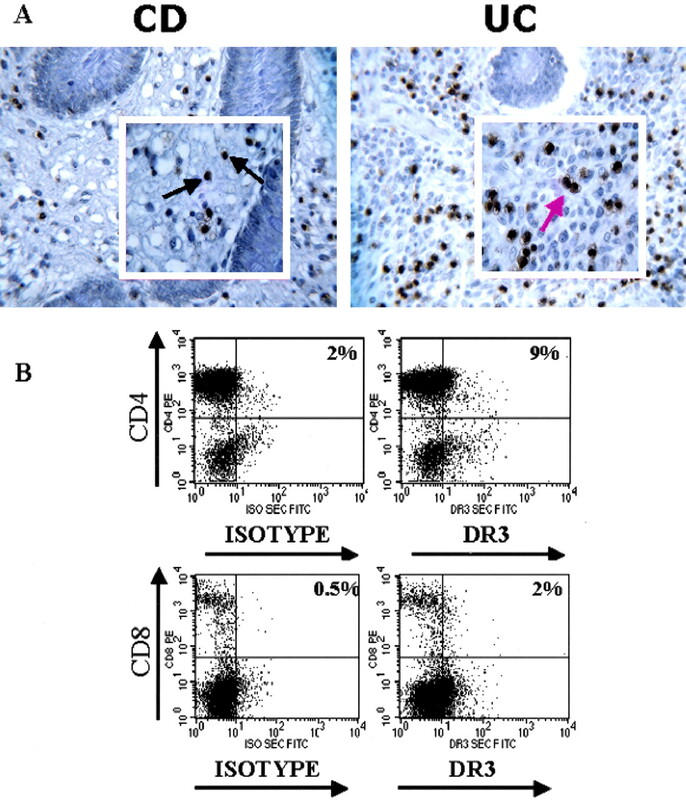 Analysis on higher magnification (insets) revealed that in both CD (black arrows) and UC (red arrow), the great majority of DR3-positive cells had the characteristics of lymphocytes. Original magnification of large photomicrographs, ×40; insets, ×100. B, Enriched LPMCs populations were obtained from involved areas of an IBD patient. Cells were sequentially stained with mouse anti-human DR3 mAb (primary), goat anti-mouse FITC-conjugated IgG (secondary), mouse anti-human APC-conjugated CD45, and mouse anti-human PE-conjugated CD4 or CD8 Abs. Lymphocytes were gated by size and CD45 expression, and the percentages of CD4+/DR3 or CD8+/DR3 double-positive cells were analyzed by flow cytometry. Data shown are representative of five experiments. Since TL1A was shown to have IFN-γ costimulatory properties in lymphocytic cell lines (20), we tested whether the same function could be detected in cultures of freshly isolated LPMC. LPMC were stimulated with low dose PHA and assayed for their ability to secrete IFN-γ in the presence or the absence of TL1A. Suboptimal stimulation of LPMC best demonstrated the additive effects of TL1A stimulation. In fact, the lower the baseline production of IFN-γ by LPMCs, the greater was the stimulatory effect of TL1A addition in the cell culture (data not shown). As shown in Fig. 7⇓, addition of TL1A in cultures of PHA-stimulated LPMCs from non-IBD patients resulted in a dose-dependent increase in IFN-γ (1.2-fold over the baseline for low dose TL1A and 2.2-fold for high dose TL1A stimulation). Interestingly, LPMCs from CD patients showed a more intense response to TL1A stimulation than non-IBD-derived LPMCs (Fig. 7⇓). This result was evident for LPMCs of noninvolved areas (1.4-fold over the baseline for low dose TL1A and 2.9-fold for high dose TL1A stimulation) and was further increased in LPMCs from involved areas (1.7-fold over the baseline for low dose TL1A and 4-fold for high dose TL1A stimulation). Overall, these results support a specific role that TL1A may play in generating or, more probably, in maintaining IFN-γ-mediated, Th1-type immune responses in the lamina propria of CD patients. TL1A stimulates IFN-γ secretion by LPMCs. Purified LPMCs from non-IBD controls and CD patients were cultured at 106 cells/ml for 72 h. Cells were stimulated with a suboptimal concentration of PHA (1 μg/ml) alone or in combination with a low (10 ng/ml) or high (100 ng/ml) dose of recombinant human TL1A. IFN-γ protein concentrations in culture supernatants were measured by ELISA. LPMCs from CD patients showed increased responsiveness to costimulation with TL1A, especially when obtained from involved intestinal areas. Data represent the mean increase in IFN-γ secretion over baseline ± SEM. The baseline IFN-γ secretion was considered the secretion upon stimulation with PHA alone for each group of patients studied. In the present study we report increased expression of TL1A, a novel member of the TNF SFPs, as well as of its cognate receptor, DR3, in IBD. In addition, our study showed the expression of TL1A on cells other than endothelial cells, namely macrophages and lymphocytes of the gut-associated immune system. Finally, we report that TL1A expression in IBD correlated with the severity of intestinal inflammation and augmented IFN-γ production in intestinal lamina propria, especially in CD. TL1A was recently identified as a TNF-like factor that represents the only known ligand for DR3, a death domain-containing member of the TNFR SFPs (20). Our study reports for the first time the expression of the TL1A/DR3 ligand/receptor pair in an inflammatory condition, namely IBD. First, our immunohistochemical data convincingly showed that increased numbers of cells that express TL1A or DR3 were present in intestinal lamina propria of patients with UC and CD, but rarely in intestinal tissues from controls. Second, very low levels of TL1A protein were detected in tissue homogenates from non-IBD controls; in contrast, the TL1A protein concentration was greatly increased in IBD patients. Our double-staining studies as well as our flow cytometry data showed that TL1A was abundantly expressed on lymphocytes and macrophages as well as plasma cells of the intestinal lamina propria. To our knowledge this is the first study to show the expression of TL1A on leukocytes. Previous studies reported that TL1A expression was confined to endothelial cells (20). In our study endothelial staining was seen occasionally, but was not a prominent feature. Differences between other studies and our data may be explained by the different types of cells tested. Whereas previous studies used cell lines for TL1A expression, in the present report we examined freshly isolated LPMCs. It is well accepted that even in nondiseased bowel, LPMCs display a partially activated immunologic phenotype (21). In fact, this state of “physiological inflammation” in intestinal lamina propria may account for the low TL1A expression in control specimens observed in our study. Interestingly, in the aforementioned study low levels of TL1A mRNA were detected in human intestinal tissue (20). Moreover, TL1A was described as a longer variant (and possibly the complete form) of TL1/VEGI, a previously reported TNF-like, endothelium-derived factor (20, 22). In line with our findings, TL1 was expressed on monocytes (22). Regarding DR3 expression, our results are consistent with those of other studies reporting that DR3 is preferentially expressed on activated lymphocytes (23, 24). Indeed, our data showed that in both CD and UC, the predominant DR3-expressing cell was the T lymphocyte. At present the function(s) of TL1A remains largely unknown. However, it has been reported that TL1A association with DR3 expressed on activated T lymphocytes acts as a costimulatory signal that results in increased T cell proliferation and increased secretion of IFN-γ and GM-CSF, but not of TNF, IL-4, IL-10, or IL-2 (20). This unique effect of selective stimulation of IFN-γ secretion prompted us to investigate a specific role that TL1A might play in mediating Th1 responses such as those characteristic of CD. In fact, several findings of our study support a strong association between TL1A and CD. First, the expression of both TL1A and DR3 was greatly up-regulated in CD. Second, the level of TL1A expression in CD patients correlated with the intensity of inflammation, being higher in severely inflamed areas, as shown by Western blot, immunohistochemistry, mRNA, and flow cytometry. Third, the cellular localization of TL1A/DR3 observed in CD patients showed that they were expressed on cells that participate in the inflammatory response taking place within the intestinal lamina propria. Indeed, interactions between lymphocytes (that express DR3 abundantly) and macrophages (a main source of TL1A in our study) are essential for the secretion of the proinflammatory cytokines responsible for the Th1 polarization observed in CD (12, 25). The unique finding of TL1A expression on lamina propria lymphocytes raises the possibility that this TNF/TNFR pair might be involved in lymphocyte-lymphocyte interactions as well. Finally, our functional studies convincingly showed that TL1A has the specific ability to costimulate LPMCs from CD patients to produce IFN-γ. Since patients with other non-IBD-related inflammatory conditions of the intestines (i.e., infectious or parasitic enterocolitis) were not included in our study, we cannot entirely exclude the possibility that TL1A may be a nonspecific inflammatory mediator that is up-regulated in different types of bowel inflammation. Nevertheless, our results provide sufficient evidence that the TL1A/DR3 interaction(s) may serve as a complementary proinflammatory-inducing factor for LPMCs, contributing to the maintenance of the mucosal Th1 polarization observed in CD-affected individuals. 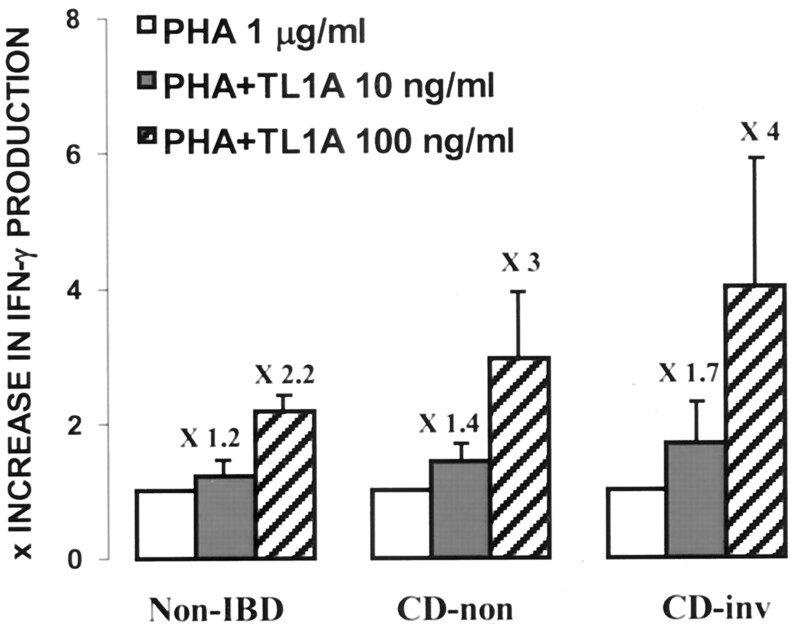 The immunological phenotype of UC is less clear compared with the pure Th1 polarization seen in CD. In accordance with this concept, diversity in TL1A expression and localization between the two diseases was observed in our study. Our immunohistochemistry and flow cytometry data showed that lymphocytes were not the major source of TL1A in UC. However, TL1A protein was increased in involved areas of UC, indicating that other cell types may produce TL1A. In fact, our immunohistochemistry data clearly point to plasma cells as the main TL1A-bearing population in UC, an observation that may be of great importance given the possible pathogenetic role of plasma cells in this condition (26). This diversity in the cellular localization of TL1A most probably reflects differences in the pathogenesis of these two conditions. There is increasing evidence that the proinflammatory TNF/TNFR SFPs play a central and multifaceted role in the pathogenesis of IBD. This concept is strongly supported by the beneficial effects of TNF blockade in CD patients (27) as well as evidence arising from studies in animal models of intestinal inflammation (17, 18, 19, 28, 29). Based on the results presented herein we propose that the TL1A/DR3 ligand/receptor pair may also participate in the pathogenesis of IBD, especially CD. We hypothesize that through their localization on interacting pathogenic cell populations and, most importantly, the induction of IFN-γ, TL1A/DR3 may serve as important factors in initiating and/or perpetuating Th1 polarization in the intestinal mucosa. Accordingly, we speculate that blockade of TL1A/DR3 interactions may be beneficial in the treatment of chronic intestinal inflammation. In conclusion, our study shows that the expression of TL1A and its receptor DR3 is up-regulated in IBD. In addition, this is the first study to describe the expression of TL1A in cells other than endothelial, namely lymphocytes and macrophages of the mucosal immune system. Finally, we report that TL1A augments IFN-γ secretion by LPMCs. Further studies are needed to explore the exact role of TL1A/DR3 in CD as well as UC pathogenesis. We thank Dr. Eugene Foley and the clinical staff of the endoscopy unit of the Digestive Health Center of Excellence at University of Virginia Health System. ↵1 This work was supported by a Research Fellowship Award from the Crohn’s and Colitis Foundation of America (to G.B. ), and U.S. Public Health Service/National Institutes of Health Grants DK42191, DK44540, and DK55812 (to F.C.). ↵3 Abbreviations used in this paper: SFPs, superfamily of proteins; CD, Crohn’s disease; h, human; IBD, inflammatory bowel disease; LPMC, lamina propria mononuclear cells; TNFR, TNF receptor; UC, ulcerative colitis. Locksley, R. M., N. Killeen, M. J. Lenardo. 2001. The TNF and TNF receptor superfamilies: integrating mammalian biology. Cell 104:487. Idriss, H. T., J. H. Naismith. 2000. TNFα and the TNF receptor superfamily: structure-function relationship(s). Microsc. Res. Technol. 50:184. Smith, C. A., T. Farrah, R. G. Goodwin. 1994. The TNF receptor superfamily of cellular and viral proteins: activation, costimulation, and death. Cell 76:959. Galon, J., I. Aksentijevich, M. F. McDermott, J. J. O’Shea, D. L. Kastner. 2000. TNFRSF1A mutations and autoinflammatory syndromes. Curr. Opin. Immunol. 12:479. Hughes, A. E., S. H. Ralston, J. Marken, C. Bell, H. MacPherson, R. G. H. Wallace, W. van Hul, M. P. Whyte, K. Nakatsuka, L. Hovy, et al 2000. Mutations in TNFRSF11A, affecting the signal peptide of RANK, cause familial expansile osteolysis. Nat. Genet. 24:45. Notarangelo, L. D., A. R. Hayward. 2000. X-linked immunodeficiency with hyper-IgM (XHIM). Clin. Exp. Immunol. 120:399. Rieux-Laucat, F., F. Le Deist, C. Hivroz, I. A. Roberts, K. M. Debatin, A. Fischer, J. P. de Villartay. 1995. Mutations in Fas associated with human lymphoproliferative syndrome and autoimmunity. Science 268:1347. Yan, M., L. C. Wang, S. G. Hymowitz, S. Schilbach, J. Lee, A. Goddard, A. M. de Vos, W. Q. Gao, V. M. Dixit. 2000. Two-amino acid molecular switch in an epithelial morphogen that regulates binding to two distinct receptors. Science 290:523. Maini, R. N., P. C. Taylor. 2000. Anti-cytokine therapy for rheumatoid arthritis. Annu. Rev. Med. 51:207. Reimold, A. M.. 2003. New indications for treatment of chronic inflammation by TNF-α blockade. Am. J. Med. Sci. 325:75. Podolsky, D. K.. 2002. Inflammatory bowel disease. N. Engl. J. Med. 347:417. Fiocchi, C.. 1998. Inflammatory bowel disease: etiology and pathogenesis. Gastroenterology 115:182. Fuss, I. J., M. Neurath, M. Boirivant, J. S. Klein, C. de la Motte, S. A. Strong, C. Fiocchi, W. Strober. 1996. Disparate CD4+ lamina propria (LP) lymphokine secretion profiles in inflammatory bowel disease: Crohn’s disease LP cells manifest increased secretion of IFN-γ, whereas ulcerative colitis LP cells manifest increased secretion of IL-5. J. Immunol. 157:1261. Monteleone, G., L. Biancone, R. Marasco, G. Morrone, O. Marasco, F. Luzza, F. Pallone. 1997. Interleukin 12 is expressed and actively released by Crohn’s disease intestinal lamina propria mononuclear cells. Gastroenterology 112:1169. Pizarro, T. T., M. H. Michie, M. Bentz, J. Woraratanadharm, M. F. Smith, Jr., E. Foley, C. A. Moskaluk, S. J. Bickston, F. Cominelli. 1999. IL-18, a novel immunoregulatory cytokine, is up-regulated in Crohn’s disease: expression and localization in intestinal mucosal cells. J. Immunol. 162:6829. Targan, S. R., S. B. Hanauer, S. J. van Deventer, L. Mayer, D. H. Present, T. Braakman, K. L. DeWoody, T. F. Schaible, P. J. Rutgeerts. 1997. A short-term study of chimeric monoclonal antibody cA2 to tumor necrosis factor α for Crohn’s disease: Crohn’s Disease cA2 Study Group. N. Engl. J. Med. 337:1029. Mackay, F., J. L. Browning, P. Lawton, S. A. Shah, M. Comiskey, A. K. Bhan, E. Mizoguchi, C. Terhorst, S. J. Simpson. 1998. Both the lymphotoxin and tumor necrosis factor pathways are involved in experimental murine models of colitis. Gastroenterology 115:1464. Liu, Z., K. Geboes, S. Colpaert, L. Overbergh, C. Mathieu, H. Heremans, M. de Boer, L. Boon, G. D’Haens, P. Rutgeerts, et al 2000. Prevention of experimental colitis in SCID mice reconstituted with CD45RBhigh CD4+ T cells by blocking the CD40-CD154 interactions. J. Immunol. 164:6005. Malmstrom, V., D. Shipton, B. Singh, A. Al-Shamkhani, M. J. Puklavec, A. N. Barclay, F. Powrie. 2001. CD134L expression on dendritic cells in the mesenteric lymph nodes drives colitis in T cell-restored SCID mice. J. Immunol. 166:6972. Migone, T. S., J. Zhang, X. Luo, L. Zhuang, C. Chen, B. Hu, J. S. Hong, J. W. Perry, S. F. Chen, J. X. Zhou, et al 2002. TL1A is a TNF-like ligand for DR3 and TR6/DcR3 and functions as a T cell costimulator. Immunity 16:479. Zeitz, M., W. C. Green, N. H. Peffer, S. P. James. 1988. Lymphocytes isolated from the intestinal lamina propria of normal, non-human primates have increased expression of genes associated with T-cell activation. Gastroenterology 94:647. Tan, K. B., J. Harrop, M. Reddy, P. Young, J. Terrett, J. Emery, G. Moore, A. Truneh. 1997. Characterization of a novel TNF-like ligand and recently described TNF ligand and TNF receptor superfamily genes and their constitutive and inducible expression in hematopoietic and non-hematopoietic cells. Gene 204:35. Chinnaiyan, A. M., K. O’Rourke, G. L. Yu, R. H. Lyons, M. Garg, D. R. Duan, L. Xing, R. Gentz, J. Ni, V. M. Dixit. 1996. Signal transduction by DR3, a death domain-containing receptor related to TNFR-1 and CD95. Science 274:990. Screaton, G. R., X. Xu, A. L. Olsen, A. E. Cowper, R. Tan, A. J. McMichael, J. I. Bell. 1997. Lard: a new lymphoid-specific death domain containing receptor regulated by alternative pre-mRNA splicing. Proc. Natl. Acad. Sci. USA 94:4615. Mahida, Y. R.. 2000. The key role of macrophages in the immunopathogenesis of inflammatory bowel disease. Inflamm. Bowel Dis. 6:21. Thoree, V. C., S. J. Golby, L. Boursier, M. Hackett, D. K. Dunn-Walters, J. D. Sanderson, J. Spencer. 2002. Related IgA1 and IgG producing cells in blood and diseased mucosa in ulcerative colitis. Gut 51:44. Sandborn, W. J., S. R. Targan. 2002. Biologic therapy of inflammatory disease. Gastroenterology 122:1592. Totsuka, T., T. Kanai, K. Uraushihara, R. Iiyama, M. Yamazaki, H. Akiba, H. Yagita, K. Okumura, M. Watanabe. 2003. Therapeutic effect of anti-OX40L and anti-TNF-α MAbs in a murine model of chronic colitis. Am. J. Physiol. 284:G595. Marini, M., G. Bamias, J. Rivera-Nieves, C. A. Moskaluk, S. B. Hoang, W. G. Ross, T. T. Pizarro, F. Cominelli. 2003. TNF-α neutralization ameliorates the severity of murine Crohn’s-like ileitis by abrogation of intestinal epithelial cell apoptosis. Proc. Natl. Acad. Sci. USA 100:8366.